Bitter AFC North rivals will collide to open up Week 2 as the Pittsburgh Steelers will be on the road to battle the Baltimore Ravens. The “Thursday Night Football” affair is part of a full schedule of games on the NFL Confidence Pool Week 2 sheet. You download and print off the NFL Confidence Pool Week 2 sheet absolutely free. You can also get a more traditional Week 2 Pick Em sheet for free. Both printable sheets are courtesy of PrintableBrackets.net. Ben Roethlisberger and the Steelers and Joe Flacco and the Ravens engaged in two classic matchups during the 2013 season. In Week 7, the Steelers escaped with a 19-16 victory over the then defending Super Bowl champions in Pittsburgh. The Ravens returned the favor by capturing a 22-20 victory in Baltimore on Thanksgiving night in Week 13. 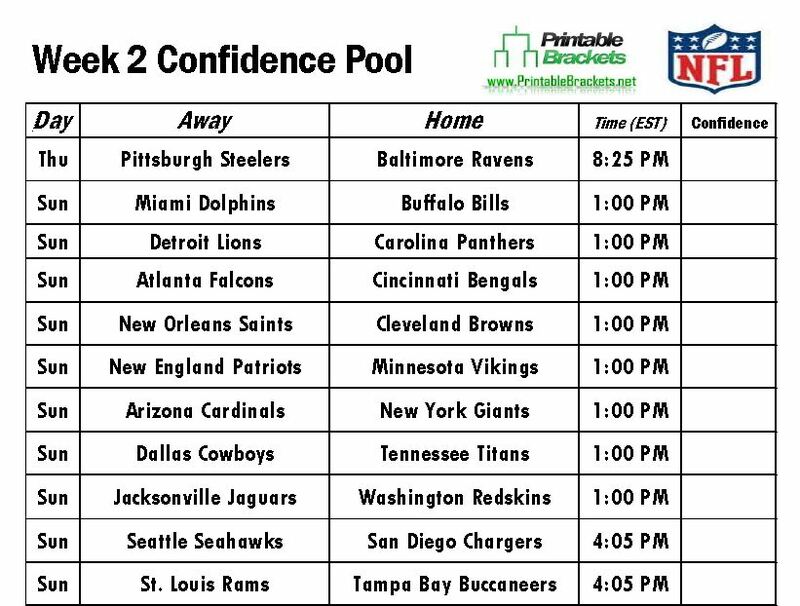 Meanwhile, there are several other notable games on the NFL Confidence Pool Week 2 sheet. Two teams looking to make noise in the NFC will hook up when the defending NFC South champion Carolina Panthers host Calvin Johnson and the Detroit Lions. In other action on Sunday afternoon, the New England Patriots will be on the road to face the Minnesota Vikings, the San Diego Chargers will welcome the defending Super Bowl champion Seattle Seahawks, while Peyton Manning and the Denver Broncos will host the AFC West rival Kansas City Chiefs.